Jeff Showalter, Sales Manager, Neo-Metro. Per the Memorial Museum mission statement, the memorial is in honor of victims of the attacks, those who risked their lives to save others, those who survived and all who demonstrated extraordinary compassion in the aftermath. “This is without a doubt one of the most significant projects the Morris Group International family has ever had the privilege to work on. As a U.S. Based company, our presence there holds great significance for us.” Don Morris, President/CEO, Morris Group International. 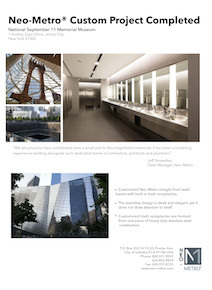 In 2006, Neo-Metro got word we would be manufacturing sinks for the National September 11 Memorial Museum In February of this year, we had the opportunity to visit the museum while still under construction to see our small contribution to this memorial. The basins in the bathrooms at the National September 11 Memorial Museum are customized Neo-Metro (System M2 8981) straight front washbasins with built-in trash receptacles. The seamless design is sleek and elegant, yet it does not draw attention to itself. Because the basins and trash receptacles are formed from one piece of heavy duty stainless steel construction; they are easy to keep clean and will withstand the test of time.